What Makes a Wine Age-Worthy? People tend to stash expensive bottles of Bordeaux in their cellars to age but would never think to do the same with a $13 bottle of New Zealand sauvignon blanc. Ever wonder why? The answer lies in this very basic formula that makes certain wines cellar-worthy or suitable for long-term aging: Tannins + Acid + Fruit. When brought together in perfect balance, these three core elements will equip a wine with everything it needs to evolve beautifully over time, maintaining its structure, its freshness, its overall integrity in the bottle, and bringing about that je ne sais quoi that you can only really get from aged wines. As a general rule of thumb, reds tend to have more aging potential than whites because reds are generally higher in tannins—those mouth-puckering compounds found in the skins, stems and seeds of grapes. Red wines are macerated on their skins during the fermentation process in order to extract color (a wine’s color comes primarily from the grapes’ skins). During maceration, the wine also soaks up tannins, which act as a preservative and give the wine a structural backbone. The more tannins a wine has, the longer it will be able to age. White wines are typically fermented without skin contact, which keeps their tannin levels low and keeps their color “white” or pale to golden yellow, depending on the grape variety. There are winemakers who choose to ferment white wines on their skins in order to attribute additional body and structure to the wine, but this is not as common. Acidity also has preservative qualities, so wines (both red and white) that are high in acid tend to be much more age-worthy than wines that are low in acid. Certain grapes such as cabernet sauvignon, nebbiolo, pinot noir and chardonnay have naturally high acidity levels, which makes them perfect candidates for aging. So it’s no surprise that wines that typically get cellar treatment include pricy California cabernets, Barolos and Barbarescos (made from nebbiolo), red Bordeaux (many of which are cabernet-based), red Burgundy (made from pinot noir) and white Burgundy (made from chardonnay). This may seem obvious, since wine is essentially made from fruit, but not all wines have enough fruit content to age well. When other elements in a wine such as the acidity or alcohol overpower the fruit content, the wine is much less likely to withstand the tests of time. So what happens to wine as it ages and what’s the real point of cellaring wine as opposed to drinking it young? For starters, time in the bottle can change a wine’s color, aromas, flavors and texture in pretty amazing ways, making it far more complex, elegant and desirable than when it was first bottled. The first change you’ll see when you examine an aged wine is its color. As wine ages in the bottle, oxygen passes through the cork since cork is a porous material (this only happens with natural corks, not synthetic corks or screw caps). This exposure to oxygen causes wine to turn brown, just like a cut apple will turn brown when left out on a counter. If you look at a glass of chardonnay that’s a deep shade of gold as opposed to pale yellow, you can tell immediately that the wine has been aged (either in barrel or in bottle or both). Similarly, if you look at a glass of Barolo that has a brownish, brick-colored hue as opposed to a bright purple hue, you know immediately that it has been aged (again, either in barrel or in bottle or both). Wines that are young (within one to three years of their harvest date) will typically possess aromas and flavors of fresh fruit, while aged wines tend to take on stewed or dried fruit notes. Think prunes as opposed to fresh plums, raspberry compote as opposed to fresh raspberries, or cherry cordial as opposed to fresh cherries. 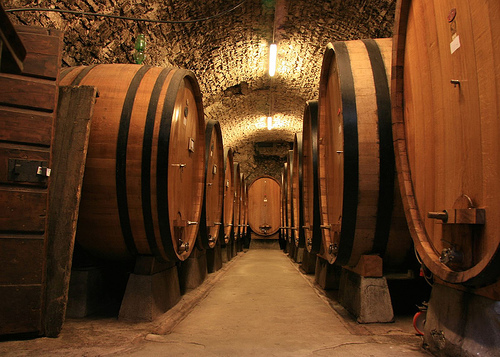 Aged wines will also present earthy elements such as leather, tar, mushrooms and tobacco, nutty aromas of toasted almond or marzipan, and in the case of aged riesling, petrol (as in gasoline) or honey. Oxygen has a mellowing effect on tannins so the longer you cellar a wine, the softer and more elegant it will become. It’s amazing what time in the bottle can do for brawny, muscular wines that start out having unforgiving tannins. As the Rolling Stones said: Time is on my side!